Wine Destinations & Gourmet Getaways... someone has to write these dee-licious stories so why not Dee! I'm looking for a few good writers who are passionate about wine and wine travels. Seeking contributors for the site I'm managing . 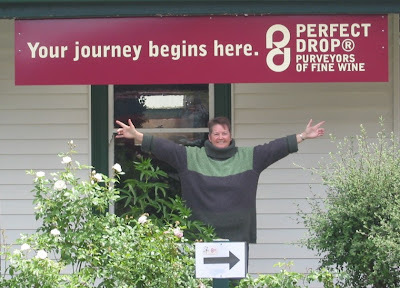 I'll be contributing stories about my adopted wine country - Oregon - and the wine scene there, including the TTTT group. That's Third Tuesday Twilight Tasting at West Cafe. where all oenophiles are welcome. Want to contribute? Be in touch for the dee'va dee-tails: Dee can be reached here. I've always wanted to name my tour business Vino Ventures on Vespas. I did manage to get a sign painted on the fender with the URL and logo, but alas I never owned a sidecar to take someone on an off-the-beaten-track wine tour of my dreams. I became a wine scribe so I can contribute to wine blogs and write feature articles for gourmet travel magazines. You can check out a few of my blogs, including vinoventures.blogspot.com (more wine tales) and copywritingcafe.com (more writing services) or deefarrell.com to learn more about me as a Tour Guide, Wine Tasting Hostess and Wine Destination Writer. Been doing wine tasting club presentations for 25+ years. Operated Vino Ventures in Australia for four years.